This guide will illustrate how to get you going on EE and AoC, from start to finish. It was done on Windows Vista, but the steps are all the same for XP. All images can be clicked on and enlarged. Insert your CD or mount your ISO file. 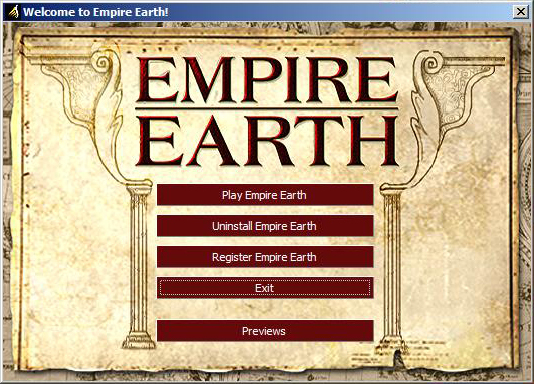 In the autoplay window, click "Install Empire Earth." This will run the installer for EE. This is pretty straight-forward. During the install process, you can choose your setup options (such as where to install). 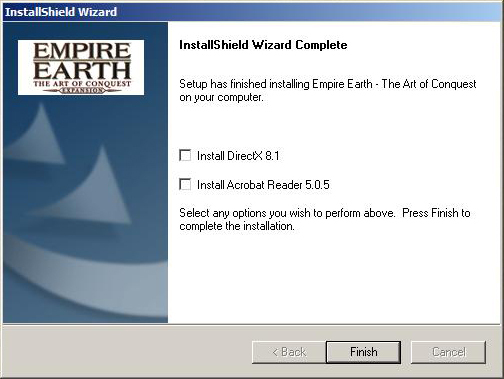 The default folder for installation is "C:\Sierra\Empire Earth" -- personally, I will install to "C:\Program Files\Sierra\Empire Earth." Finish the install (check the install DirectX box if you do not have it), then exit the autoplay window. 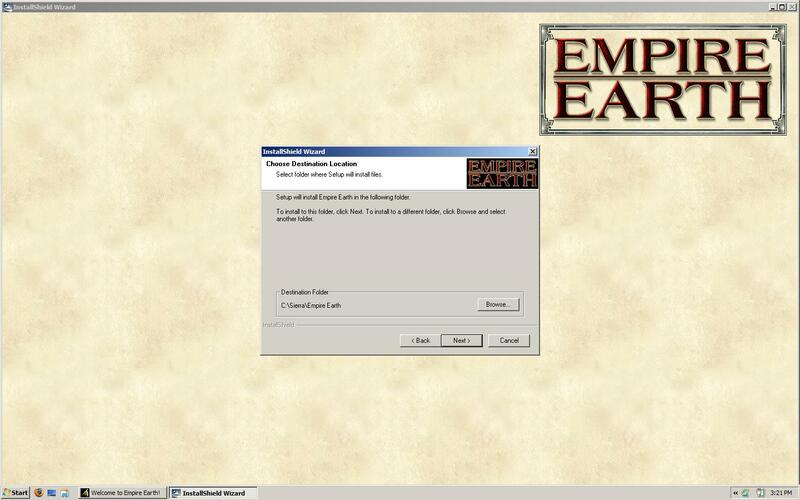 If you downloaded EE, do not apply any No-CD cracks, as this will cause problems later. 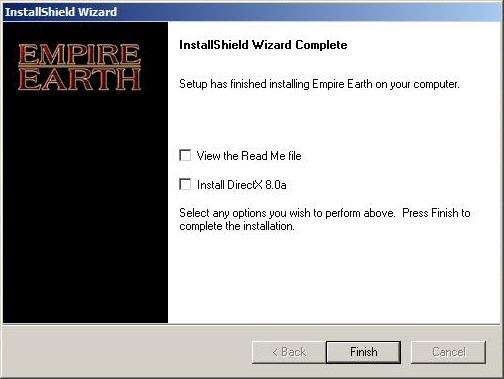 Empire Earth requires the installation of two official updates released by Sierra. You can get them on our website HERE. Download the appropriate updates for your language, and save them to a place such as your Desktop. If any of the files are inconsistent before patching you will get the following error message. This usually happens when a No-CD is applied to version 1.0 for a pirated copy. 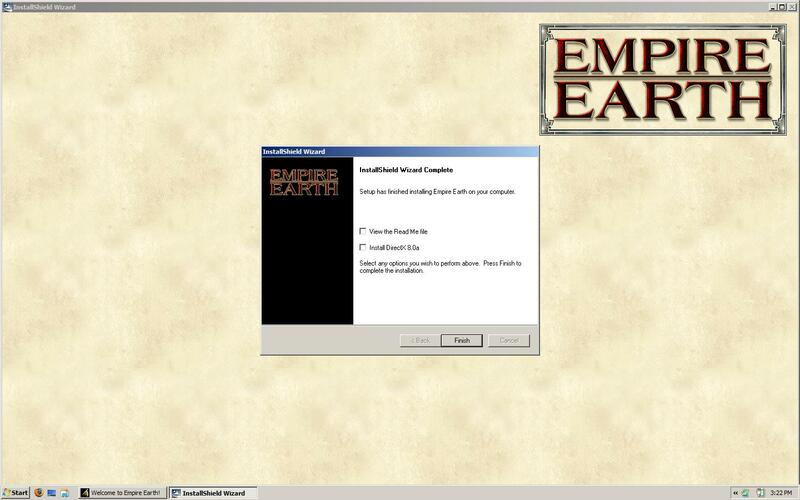 If "Empire Earth.exe" wasn't backed up, a full reinstall is the only way to resolve this problem. This error will also come up if you already have one or both of these patches installed. Next, run the 2.0 patch. 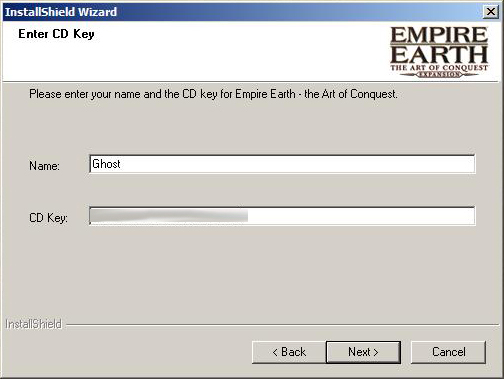 For this install, you are required to put in the CD-Key. Then, just follow the installer until it says you are finished. If you need a CD-Key, a quick search yields: LES9-RUC2-TYM8-CEJ3-2727. A Fixed-EXE, or No-CD crack, will allow you to play EE without using the CD. Contrary to some people's beliefs, these are not illegal. Applying this crack is completely optional. The v2.0 No-CD can be downloaded from our website HERE. 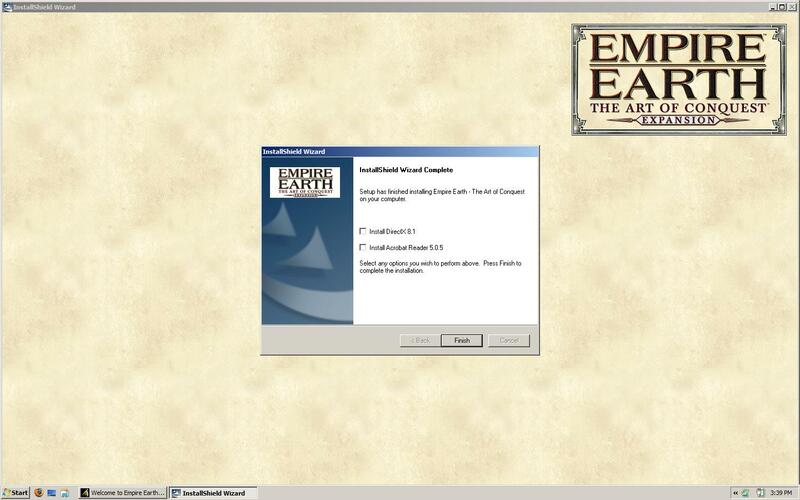 This crack works for all languages of Empire Earth. 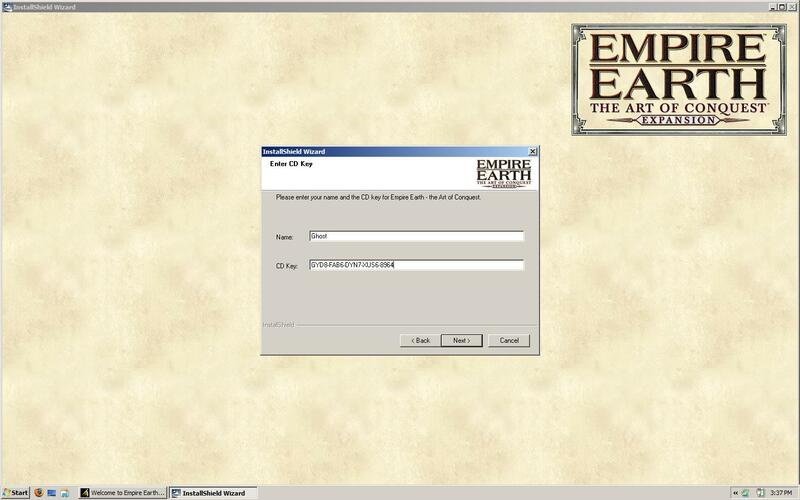 Inside the ZIP Archive is a replacement EXE file for your game. 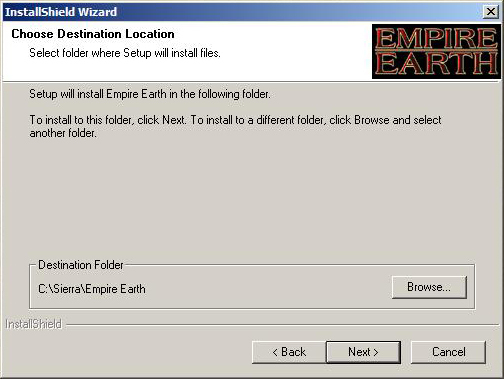 Simply unzip to your EE root directory (default is "C:\Sierra\Empire Earth"). It will ask you to replace the current file. 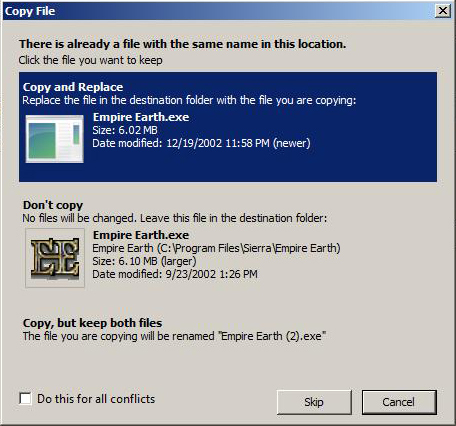 If you wish (recommended), you can backup your old "Empire Earth.exe" file (just rename it to "Empire Earth.bak.exe" or whatever) in case the crack does not work for you. Otherwise, just go right ahead and replace it. If you do not have AoC, then lets SKIP to EE Lobby Setup and Use. 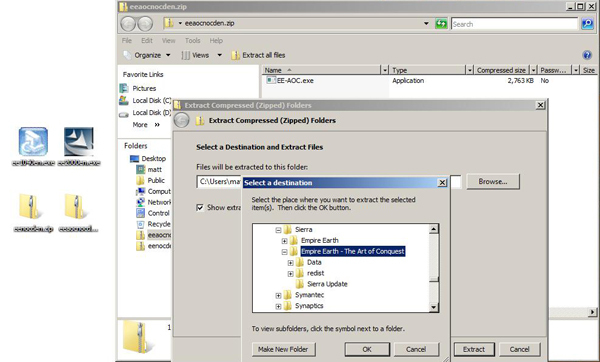 Insert your CD or mount your ISO file. In the autoplay window, click "Install." This will run the installer for AoC. Once again, a straight-forward, normal applicaton installation. 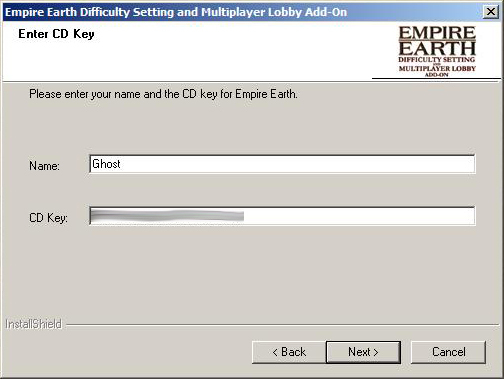 During the install process, you will enter your CD-Key and you can choose your setup options (such as where to install). If you need a CD-Key, a quick search yields: BUN9-CAB8-GYC5-CUD3-4844. 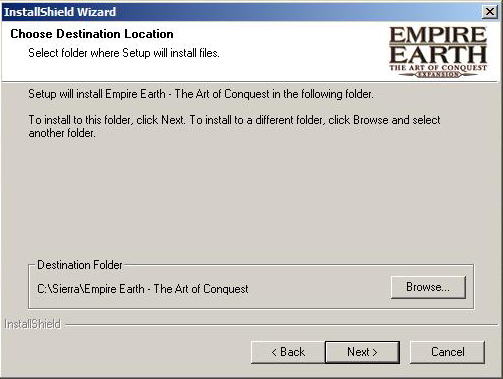 The default folder for installation is "C:\Sierra\Empire Earth - The Art of Conquest" -- personally, I will install to "C:\Program Files\Sierra\Empire Earth - The Art of Conquest." Finish the install, then exit the autoplay window. 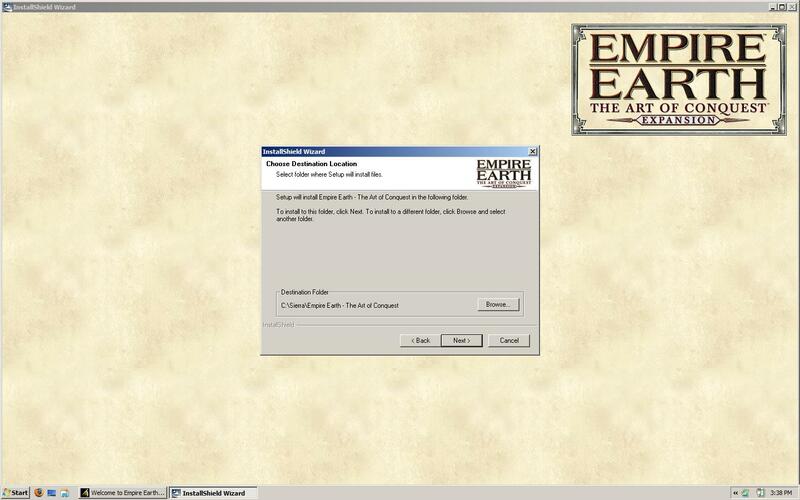 A Fixed-EXE, or No-CD crack, will allow you to play AoC without using the CD. Contrary to some people's beliefs, these are not illegal. Applying this crack is completely optional. The AoC No-CD can be downloaded from our website HERE. This crack works with all languages of AoC. 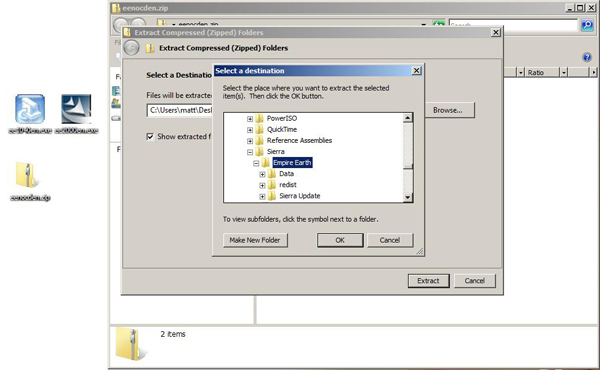 Inside the ZIP Archive is a replacement EXE file for your game. 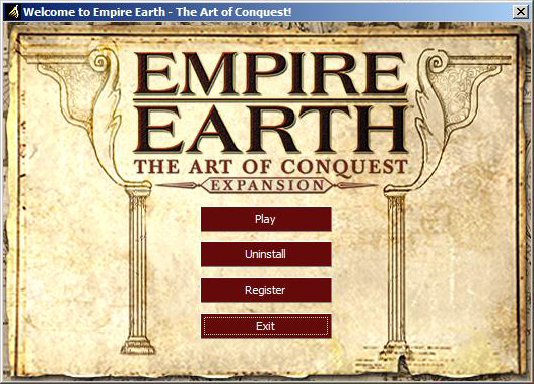 Simply unzip to your EE root directory (default is "C:\Sierra\Empire Earth - The Art of Conquest"). It will ask you to replace the current file. 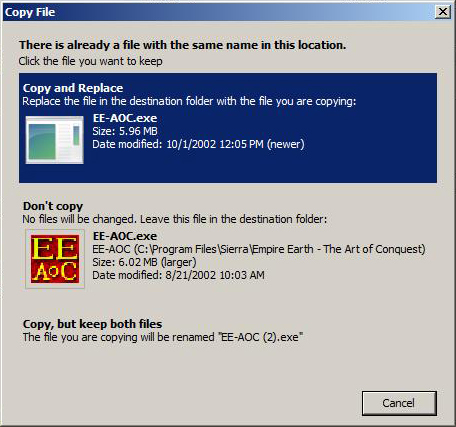 If you wish (recommended), you can backup your old "EE-AOC.exe" file (just rename it to "EE-AOC.bak.exe" or whatever) in case the crack does not work for you. Otherwise, just go right ahead and replace it. You now have EE and AoC successfully installed and updated. 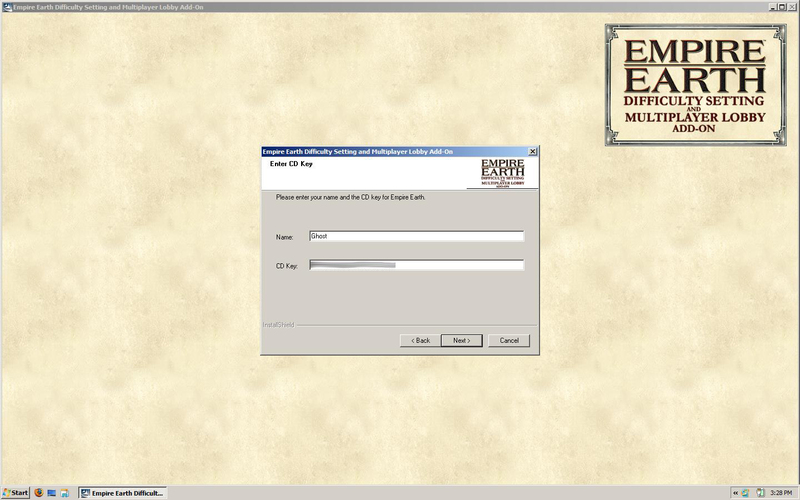 Before use with the EE Lobby software, you will also have to apply the Direct Connect Patch. A how-to for this is found on the Lobby Guides page (HERE).